Can I use my US passport photo for the application? 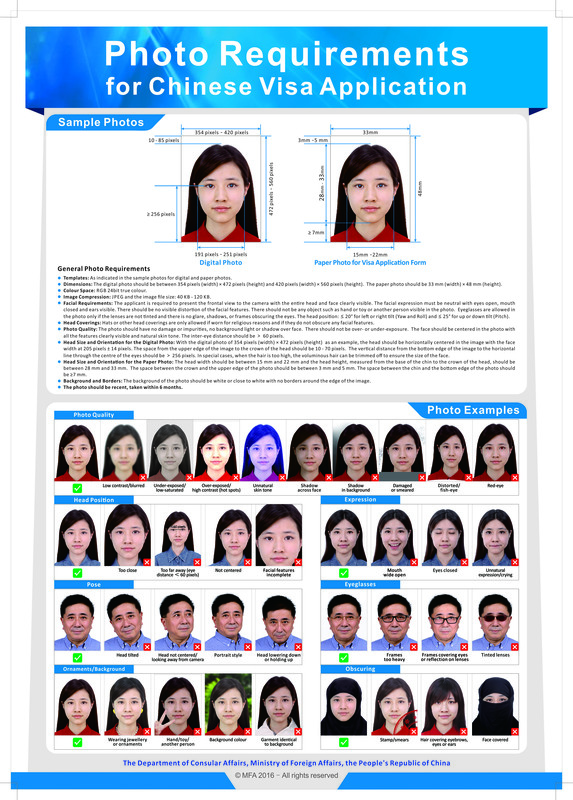 The photo requirements of Chinese visa is very different than US passport photo. Please see the embassy website for details. If you have problems to get a qualifying photo, we do provide service to touch your digital photo and print for submission for a $15 fee. Please contact us for details. Do I need to sign the visa application form on my kids’ behalf? YES. The parent or guardian shall sign on behalf of applicants who are under 18 years old for both section 4 and section 5 on the visa application form V2013. I’m going to China on June 1, and my visa will expire on June 10. Can I still stay in China after June 10th? Yes. You can enter China any time before your visa expiration date if you have a multiple entry visa. You may stay in China for “Duration of each stay after entry” days marked on your visa. Can we complete the visa application form by hand? Handwritten visa application forms are not accepted by the Chinese Embassy . You must complete the form on the computer. Is an appointment required for a visa application? Can I entrust someone else to apply for me? No appointment is required. You may entrust someone else or a travel/visa agent (VMS included) to come to the visa office to complete the application process, but mail applications are not accepted by the Chinese Embassy.